1.High quality Stainless Steel 304 hose clamp, plating Zinc. 2.The clamps kit contains: 10PCS 5/16-29/64"(8-12mm), 10PCS 3/8-5/8"(10-16mm), 10PCS 1/2-3/4"(13-19mm), 10PCS 5/8-1"(16-25mm), 10PCS 3/4-1-5/32"(19-29mm), 10PCS 7/8-1-1/4"(22-32mm), 10PCS 1-1-1/2"(25-38mm), 10PCS 1-1/4-1-23/32"(32-44mm). 3.Hose clamps attach hoses to fittings to prevent flow leakage Hose clamps are suitable for a large number of industries, and commonly used in industrial, electronic, and automotive applications. 4.Stainless Steel screw resists corrosion. 1.They are easy to tighten and loosen and they are made of from zinc plated steel for durable long life. 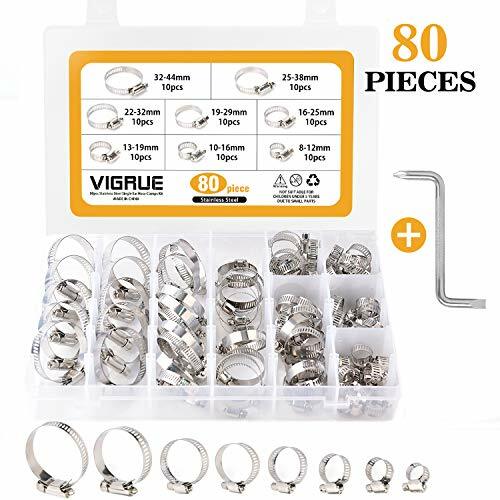 2.Use these VIGRUE clamps to replace and throw away those cheap factory hose clamps, which are inferior in design and quality. Spend your money for the good ones VIGRUE will get you satisfied get yours today. Free dual-purpose screwdriver:One head is used as straight screwdriver,another head is used as cross screwdriver. If for any reason our set doesn't fit your expectations or if something is wrong with the set then we will replace it at no additional cost or refund your money. We are proud of our product and when you receive yours you will be happy with it too! √ High quality Stainless Steel 304 hose clamp, plating Zinc.So our hose clamps can be used for many long years. √ Hose clamps attach hoses pipe joints to fittings to prevent flow leakage， save time and money on costly repairs. √ Stainless Steel screw resists corrosion. Package quantity: 80 Pieces. All of hose clamps will be packed in a sturdy convenient case, can be use for a storage box,is organized to you. √ We put a free dual-purpose screwdriver in case so you can easy to tighten and loosen hose clamps.tighten evenly with worm gear drive. Ideal for plumbing, automotive, electronic and mechanical applications. √ The clamps kit contains a wide variety of clamp sizes: 10PCS 5/16-29/64"(8-12mm), 10PCS 3/8-5/8"(10-16mm), 10PCS 1/2-3/4"(13-19mm), 10PCS 5/8-1"(16-25mm), 10PCS 3/4-1- 5/32"(19-29mm), 10PCS 7/8-1-1/4"(22-32mm), 10PCS 1-1-1/2"(25-38mm), 10PCS 1-1/4-1-23/32"(32-44mm). By Crain Cutter Co., Inc.